Your incident reporting software is a crucial part of your security guard company services. So it follows that, with the advancements in technology, stakeholders no longer want to be sent barely intelligible paper or scanned reports. Nor do they want to receive concise and professional reports, only a week later than they were taken. Real-time, mobile security guard incident reporting app software, integrating photos and video, is the only way to compete in today’s market. GuardMetrics makes security guard incident reporting easy, affordable and professional. 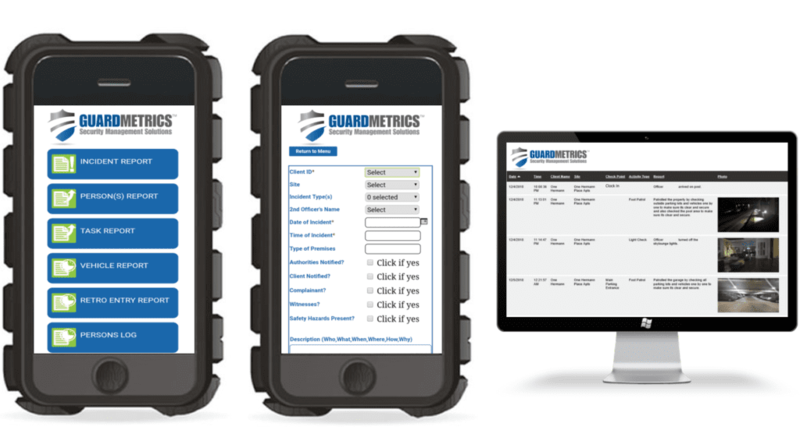 The GuardMetrics incident reporting software was designed specifically for the security guard service industry. It was designed by managers from security guard companies. It is a cloud-based, real-time, customizable security guard incident reporting system deployed by way of a security guard reporting app any mobile smart-device: iPhone, Android or Google smartphones, tablets, desktop PC’s, laptops and Macs. This makes it easy for you to seamlessly roll out GuardMetrics to a single site, with a single guard, on a company owned device, or hundreds of sites and thousands of users simultaneously, all using their personal mobile smartphones. And–always with the end-user in mind–minimal user training is required, though always available. Call us today for a no cost Demo of our GuardMetrics Security Guard Incident Reporting Software. GuardMetrics will provide our security company clients with branded and customized incident reporting templates. This means that your clients will know that you are bringing transparency to the relationship, which makes for better client acquisition and retention! We will do this for you, prior to your set-up training, so your on-boarding will still be fast and easy. Push incident reports, or any event, to any company personnel that need an immediate alert. 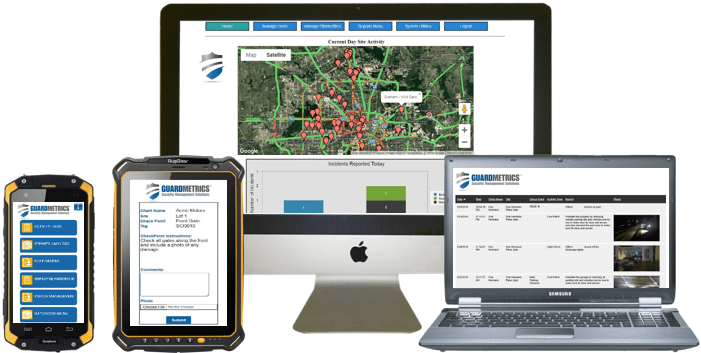 Have it all as part of the fully integrated GuardMetrics guard tour and patrol tracking system. Call GuardMetrics now to get your security officer Incident Reporting Software integrated and streamlined.